Thanksgiving. Dinner. Do those two words send a chill up your spine? If you’re cooking this year (like I am), you’re probably not too keen on being reminded just how much work goes into creating this annual feast. But don’t despair! You can get it all done, and you can still cook a tasty feast even with some time-saving shortcuts. 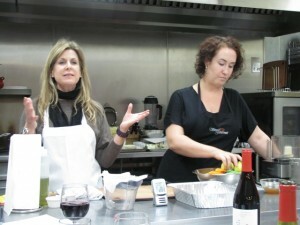 I was fortunate to spend an evening with the pros over at Simple Gourmet, where I took a “Simple Thanksgiving” cooking class and I learned plenty of time-saving tricks to share with you. Get it fresh: Frozen birds tend to take longer to cook and dry out more quickly when cooking. Use the convection oven setting: Does your oven have a convection setting? That’s the best way to cook a big turkey because the heat will circulate evenly throughout the oven. You can take up to 30 minutes off the cook time just by using a convection oven. Use a meat thermometer: Don’t trust the pop-up buttons. 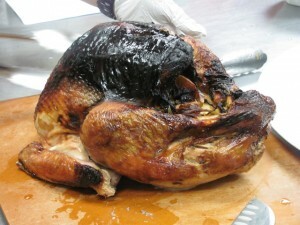 Cook the turkey until the white meat is 165 degrees. While you let it “rest” the meat will continue cooking. No need to baste: When you pour liquid over the turkey, it basically just wets the skin and doesn’t soak through to the meat. And when you keep opening and closing the oven, the oven temp goes down and the bird takes longer to cook. The ironic end result? A drier turkey. First in, first out: The turkey should be the first thing to come out of your oven so it has plenty of time to rest. You can use the remaining oven-free time to finish off your stuffings or any baked or roasted vegetables. Save the carcass: Don’t throw away those beautiful bones. They’ll make for an amazing turkey soup over the next few days. Also, don’t call it “Turkey Carcass Soup” like my mom used to. I’m sure you can think of a better name for it. Keep it lump-free: Add warm liquids slowly, and stir thoroughly before adding more liquid to keep the lumps out. Also it’s best to work in a shallow pan so lumps of flour have nowhere to hide. Prep ahead of time: Anything you can do ahead of time, do it! That includes chopping, dicing, or slicing vegetables. 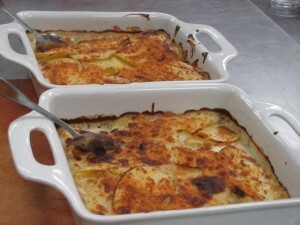 If you are slicing potatoes for a gratin, store them overnight in water in the refrigerator. Spread it out: Everything will cook faster if you put it in shallow containers. That goes for your dressing (stuffing), potatoes, and casseroles. 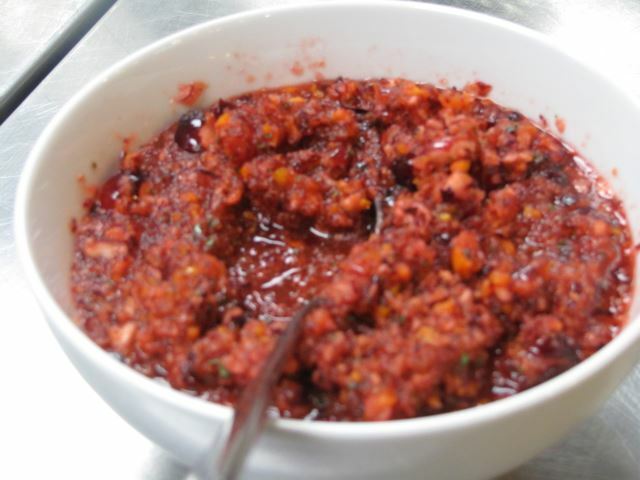 Don’t cook if you don’t have to: Simple Gourmet made an amazing cranberry relish that you can put together in about five minutes using your food processor. Then you let it stand at room temp (or chill it) until ready to serve. That’ll allow you to save some valuable stovetop space that you might have used for cooking cranberry sauce. Preheat oven to 400 degrees. In a small pot, combine the pomegranate juice, honey, brown sugar, orange zest, cinnamon stick, and garlic clove. Place over high heat, bring to a boil, and cook for 5 minutes or until reduced by half (just thick enough to coat the back of a spoon). Remove from heat and whisk in the cold butter. Toss the potato wedges with olive oil, salt and pepper. 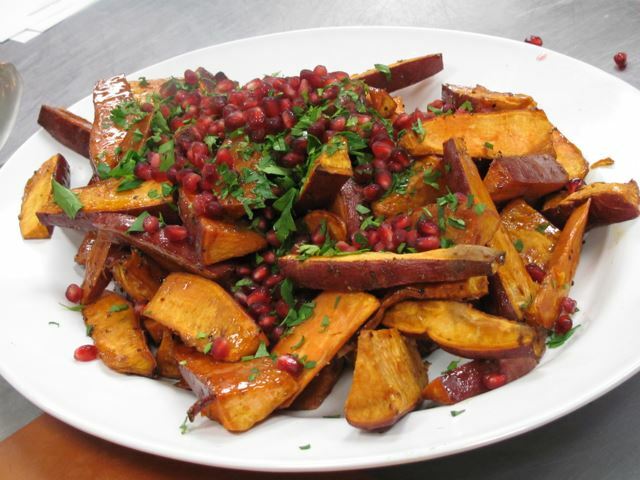 Add about 1/4 cup of the pomegranate glaze and place on baking sheets to the potatoes are not overlapping. Roast for 10 minutes. Drizzle with a little more glaze and continue roasting until tender – about another 10 minutes. Remove from oven and empty into a large bowl. 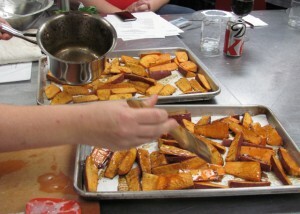 Toss with the remaining glaze. taste and season with more salt and pepper as needed. Serve warm or room temperature topped with the pomegranate seeds and chopped parsley for garnish. Seves 8 to 10. Amazing, right? Many thanks to Simple Gourmet for this educational feast. If you’re in the area, check them out for full-service catering, cooking courses, culinary teambuilding activities, private cooking parties – and best of all – kids’ classes and camps. If your kids are between 8 and 14, you may want to sign them up for mini-camps or workshops offered throughout the year. And if you go, tell them Jolly Tomato sent you! Blogger disclosure, a.k.a. the fine print: I was treated to a cooking class by Simple Gourmet. I was not compensated for this post. All opinions expressed are my own.